IOA member and OMJ judge Geoff Walker had the honour of once again been asked to place the awards for the new colour section. 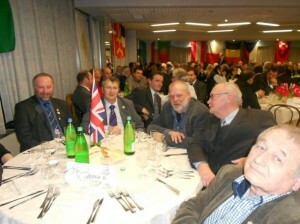 The Gala dinner was attended by 500 guest’s from all countries and in total from the UK were fourteen plus in the photo COM-UK president Richard Lumley with fellow converyor Gary Mann with other converyors from Holland. 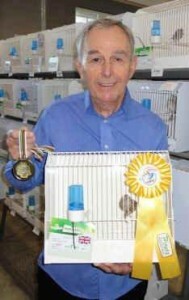 From the IOA affiliated society Maurice O’Conner who is in charge of the Irish Fancy International Society now that he lives back in the UK, he had a very good show winning Gold/Silver/Bronze with his birds. 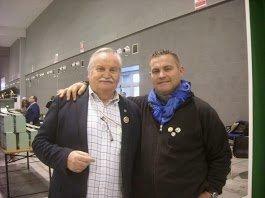 For the first ever world show two new breeders of the Irish Fancy exhibited their birds, Geoff White from Ferndown and Willie McKay from Scotland. 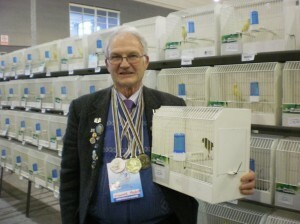 In a very strong Fife section Willie McKay and past World Champion had four birds which all scored 91pts, which would have won medals in past years, also from Wales Dave Shelbourne had some very good points scoring birds, also showing with fifes were Ralph Munday, Dennis Bellchambers, Graham Bradbrook, Gary Mann and Chris Smith. Solo Hoso exhibitor was Andy Early, Simon Tammam had Frills and Borders, Brian Hogg Lancashire, First time exhibitor Neville Jones had a selection of different birds which included British, along with new exhibitors Richard Lawson and Eddie Wells who both showed Greenfinches. Bernard Howlett had a very strong team out of all kinds of birds but this year he failed to pick up any medals as he was beat by better birds. 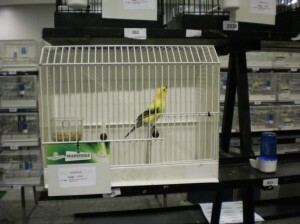 He did how ever have on show one of his London Fancy canaries. In the foreign bird section again very good to see new people having a go with different birds Peter Young with hooded zebra’s and benglase and John Ward. From further a field our members from Gibraltar Maxi Pratts and Peter Sardena put very good birds in but again better birds won the day. 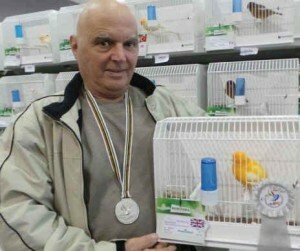 From the Norwich section once again he proves the saying of try and try again Saviour Cammilleri won a silver with one of his birds, next step is Gold. The lizard section was down a bit but Mr Lizard Stan Bolton won a Gold with a Blue lizard, also in the same section were Dave Allen and Hugh Evans. From the gloster section COM-UK President and IOA President Richard Lumley scored very good points along with his good friend Rob Wright who also had a good show. So over all looking at the different kind’s of birds we took we did ok, so its a very big THANK YOU to all IOA members because with out you we cannot have a show, remember don’t get like some in the UK only one person can win, it’s the taking part and please remember it’s only a hobby!